On 4 November a seven year-old stood before the assembled politicians in Hong Kong’s Legislative Council (Legco) and shamed them. Olivia is ‘stateless’, the child of an Indonesian refugee in Hong Kong. She told the Legco with its hard-as-stone pro-Beijing majority, “I want to go to school!” The effect was like a bomb exploding. Her audience, with a few notable exceptions were the very politicians who have stirred up a chorus of smears and denunciations of “fake refugees” and “criminals”. On 4 November these professional chatterboxes were left speechless. The occasion was a public hearing of the subcommittee on children’s rights. The mostly right wing politicians and government officials are responsible for the policies that force refugees into slums, poverty, and – if they work – into jail. Olivia’s own mother is one of them, serving a prison sentence for the ‘crime’ of getting a job to put food on the table and pay the excessive school fees charged by a ‘marketised’ education system. This little girl with her whole life in front of her cannot go to school, cannot read, cannot write. At age seven, she is guilty, of being one of the world’s 60 million refugees in the year 2017! The government claims it has implemented “15 years free education” but the reality does not match the words. For pre-school children, where government policies have created a completely privatised sector, normal fees are HK$2,800 per month – completely out of reach for poor families. 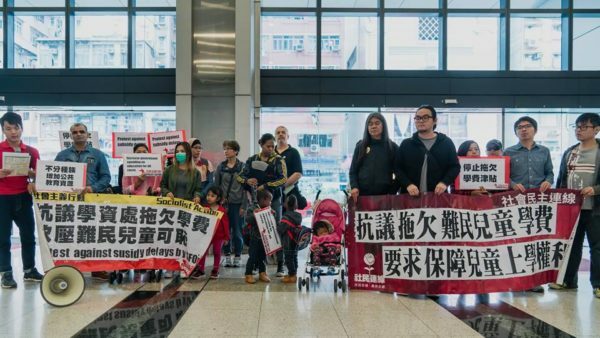 The protest campaign organised by Socialist Action (the CWI in Hong Kong), and its refugee members and their families, is targeting the Student Finance Office, under the Education Department, which is legally responsible to meet kindergarten fees for refugee kids whose parents are banned from working. The SFO has been dragging its feet on sending out the monthly payments. My name is Mira Halimah. I am an asylum seeker. I have three children. Children should have the right to go to school, but many poor families cannot see it for their children. My son is eight years old. He loves reading books. One day he asked me, “Mum, why can’t I borrow books from the library?” I don’t know how to answer! The Hong Kong public library does not allow refugee children to borrow books! What kind of rights do children have, if they cannot even borrow a book from the library? We are a family of five living in a sub-divided unit, it is about 150 square feet (13.9 square meters). The monthly rent is HK$6,000 (around 650 euro). We have already used up all the financial assistance on living. I have to borrow money from friends, asking for donation for my whole family. My children can’t take the MTR, train or bus, they are too expensive. They can’t go to any school picnic or sport day because they have no money for transport! This is not just my children, all poor children are suffering! 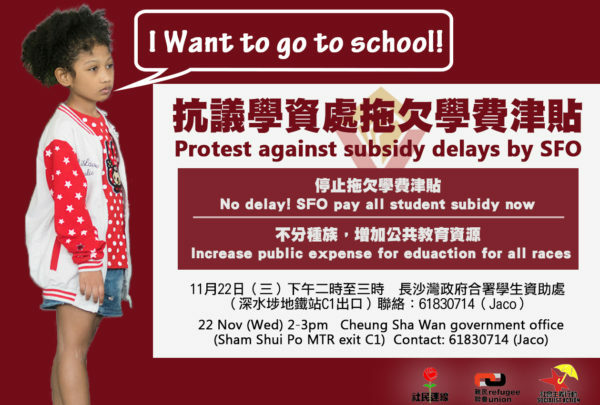 The SFO payments are always delayed three or for months for the school fees. They force me to pay the school fee first, and then I can claim it back. I don’t have money to pay. I even got a letter from the school, saying my kid will be kicked out if I don’t pay. Can you imagine how stressful it is? Some of my daughter’s classmate have already been kicked out. School fee is increasing every year and it is harder and harder for poor families to afford. There should be free kindergartens, and the Hong Kong government is responsible for this. The Social Welfare Department must increase our house rent and food subsidy, so our children can have enough food and basic education. If you cannot provide this, you should give us the right to work. We are forced to depend on the government because we are not allowed to work. We want to be able to work to feed ourselves and our children! Protest on 22 November at SFO in Sham Shui Po. 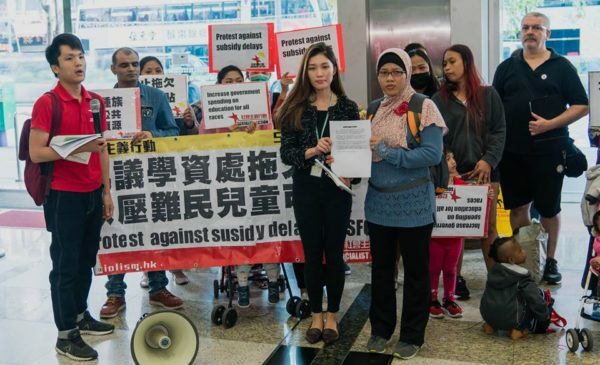 On 22 November, 30 protesters led by refugee members of Socialist Action protested at the offices of the Student Finance Office in Sham Shui Po. The protest, against delayed payment of tuition fee subsidies for refugee children, was supported by former legislator ‘Long Hair’ Leung Kwok-hung and his party, the League of Social Democrats (LSD). 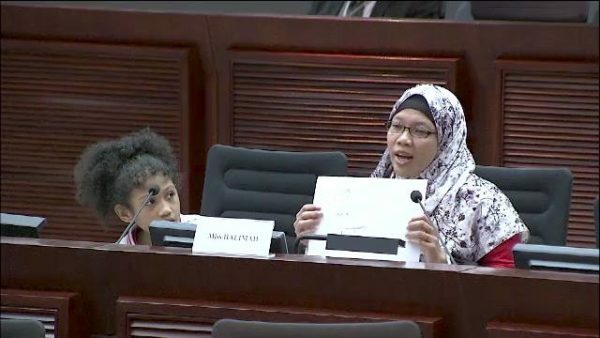 Two weeks ago the refugee parents and children took their grievances into the Legislative Council (Legco), see report below. Refugee parents together with Socialist Action organised this protest campaign after suffering months of delays by SFO in issuing monthly entitlements to allow the children to go to kindergarten. All pre-school facilities in Hong Kong are privatised and monthly fees have increased from around HK$2,000 last year to almost HK$2,800 this year. Jaco from Socialist Action complained the SFO has been very hard line in its response and refused to meet with representatives of legislators to deal with the parents’ complaints. 1 in 4 children in poverty – Tax the rich now! “For refugees in Hong Kong it is illegal to work – the maximum sentence is three years’ imprisonment. The Student Finance Office should by law pay all tuition fees for refugee children, but it has often defaulted on payments for months, or even for half a year, leaving many refugee children at risk of being thrown out of school. “Tuition fees for private kindergartens are around HK$2,800 per month, not counting school uniforms and book fees and the families of refugees who have no income cannot afford them. “Hong Kong is a paradise for the rich and hell for the the poor. The disparity between rich and poor has risen over the past nine years, with 1.35 million now below the poverty line, including one in four children. This stems from the government’s continuing privatisation of education, healthcare and housing, and using public services and tax money as a cash cow for big business consortiums.